Lost Spirits navy Style overproof rum shows dark brown, burnt orange color. Even diluting the rum with water to the common 40% ABV didn’t lighten the color very much. A crown of small beads result from swirling, followed by a few slowly forming thin legs - interesting enough to take a sip. There’s no floral perfume-like bouquet to announce the cork popping, this is high-proof, Navy style rum, with musty high ester scents dominating the aromas. You’ll also detect charred oak, pineapple and banana ripened well past their sell-by date, dried apricot, a Scotch-like smokiness, cigar tobacco, old wet shoe leather, and a tannic, off-dry red wine. There’s also a faint texture of buttery larded pie dough. The rum smells old, but surprisingly, it isn’t. Of course, at 68% ABV you’ll also get an nose full of alcohol if you’re not cautious, but even then if’s mild. In Rum Gallery’s evaluation, the aromas were more approachable and less immediate after the rum was diluted with water to 35-40% ABV and allowed to rest under cover for a few minutes. If anything, the fruit scents are probably brightened by the water. Initial reaction to tasting: Wow! Did I suddenly land in Jamaica? Heavy, powerful high-ester flavors of copper pot-distilled rum swarmed over my palate like like a force of nature. And I wanted more well before the long finish faded. As with the aromas, diluting with water softens the rum, making it sweeter on the lips, with flavor more reminiscent of a fine Bajan rum than a Jamaican, with naturally less alcohol heat and pepper on the tongue. Lost Spirits produces rum in single batches from a small copper pot still. I expect the aromas and flavors to be big and powerful with every new batch, although they may vary, as no additives adulterate the rum for consistency from batch to batch. Lost Spirits Distillery elevates to a higher level the meaning of “hand crafted.” After using a hand-made, high-maintenance wooden pot still for a few years, in late 2013 owner Bryan Davis built his own 600 gallon copper pot still and swan’s neck. He hand hammered copper sheet metal and tubing, silver-soldering the Goth contraption together in a truly unique rendering. Even the condenser, fermentation tank, boiler and aging facility are sprung from Davis’ fertile mind and wrought by his hands. Perhaps more impressive is the unique yeast he has developed for Lost Spirit’s Nay Style rum. 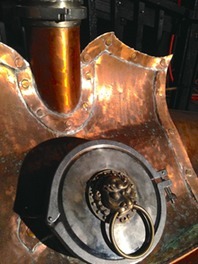 The high-ester secret was inspired by some of Jamaica’s funkiest old rum producing techniques, and distilled in two passes in Lost Spirits goth-inspired copper pot still. Lost Spirits Navy Style 57% Overproof rum is the same rum as their 68% Overproof, but diluted before casking in order to make a more approachable, if still very hearty rum. Both are distilled from Grade A molasses fermented with a dunder of rotten bananas, yeast and wild bacteria to produce high-ester flavors, then aged for a short time in a barrel seasoned with Oloroso sherry and pieces of photocatalitically charred new american oak. For a intriguing dive into Lost Spirits unique process, see Bryan Davis’ technical revelations here. Lost Spirits briefly produced a 55% ABV version of this rum (photo below), but ultimately increased it to full Navy strength. Master Distiller Bryan Davis is no Lost Spirit himself, blazing bold new paths in fermentation with his unique liquors. His acclaimed heavily peated American whiskies, Leviathan I and II and Ouroboros have up to twice the peat ppm of most traditional Scotch Whisky’s, and rival some old favorites among single malt aficionados. Opposition to new techniques in rum making generally fall into one of two camps of critics: Conservative Thinking or Product Integrity. The former don’t know any more about rum than the prattle of so many press releases. The latter have a legitimate point: rum should be real, and any adulterations should be admitted. Lost Spirits Navy Style rum is real, no colorings or additives are involved. Further, the fascinating process whereby powerfully flavorful long-chain esters are developed into the rum is fully disclosed. The rum’s flavor harkens back centuries ago to the days of pirates and untuned pot stills, yet it is as modern and innovative as any rum on the market. Nonconformist, creative, Bryan Davis has married chemistry and art into one of today’s most interesting new rums. Lost Spirits is the distillery to watch, closely. Lost Spirits has accomplished something no other American rum distiller has done. They have replicated time. The resurgence of American rum distilleries leaves them no choice but to produce unaged products, white rum, spiced and flavored rums, or rums barreled only a few short months until they are ready to bottle. None are producing high-ester rums with big flavor to rival anything from traditional Caribbean, Central- or South American rum makers. Until now. 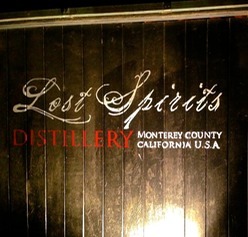 Lost Spirits Distillery are neither magicians notr alchemists. It is creative use of their knowledge of the chemistry of yeast, fermentation and distillation that puts them on top. Best of all, their processes are real and natural - there’s nothing artificial added to Lost Spirit’s’ rum. Reviewed: January 2014 at Lost Spirits Distiller in Monterey County, California, and and further during March 2014 at The Rum Gallery, USA.